They observed that the phenolic compounds in the extracts altered the cells' development, reducing the adipocytes' fat content from 8%-56%, depending on the differing phenols used. A key marker of insulin resistance decreased by 29%-64%, they found, and the cells' glucose uptake decreased by 30%-139%, depending on the chemical composition of the anthocyanins used. The smaller phenols such as quercetin, luteolin and rutin—which are present in many plant foods—played key roles in reducing some of the obesity, inflammation and some markers of Type 2 diabetes, de Mejia said. "While others, such as vanillic and protocatechuic acid, decreased the potential conversion of pre-adipocytes to adipocytes." "We calculated that all of the red dye No. 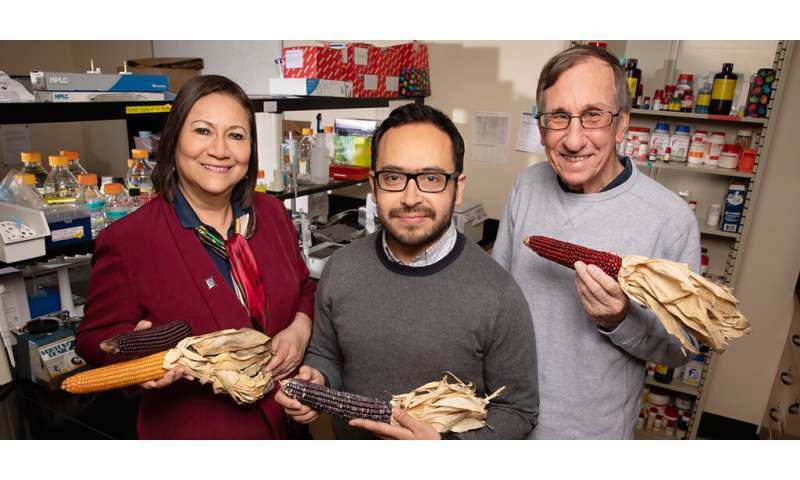 40—one of the major dyes used in the U.S. - could be replaced with the pigment derived from about 600,000 acres of corn," Juvik said. "And we could produce the anthocyanin-rich pericarp in sufficient quantities for manufacturers to add it to beverages or special products with pharmaceutical properties." "The advantage to using water to extract the anthocyanins from the pericarp is that it's the most simple, straightforward and inexpensive way for industry to remove these compounds, compared with other extraction protocols that are complicated and more expensive," Juvik said.